Making a sensitive diagnosis of knee osteoarthritis is equally elusive, according to Neil A. Segal, M.D., director of clinical research and medical director of musculoskeletal rehabilitation at the University of Kansas Medical Center’s Department of Rehabilitation Medicine in Kansas City. X-ray, the most common method of imaging to make a diagnosis, is insensitive. MRI is very accurate, but is not cost-effective. Dr. Segal and colleagues modified a commercial CT scanner to enable imaging of bilateral knees in a standing configuration and determined that standing CT imaging was more sensitive and accurate for diagnosis of osteophytes and subchondral cysts than convention al fixed-flexion radiography. They described their research in an article published in the July 2015 issue of The Physician and Sportsmedicine. The study they conducted included 20 patients, participants in the longitudinal observational Multicenter Osteoarthritis Study (MOST) of patients with knee osteoarthritis or having known risk factors to develop this condition. These patients recruited to have a standing CT exam did not have end-stage knee osteoarthritis (Kellegren/Lawrence grade less than 4) or a knee arthroplasty. Their distal thigh width on postero-anterior (PA) radiographs was less than 38.1 cm, which corresponded with a body mass index of 35. At the 84-month MOST clinic visit, each of these patients had a bilateral standing fixed-flexion PA radiograph of the tibiofemoral compartments in which knees were flexed to 20-30° and feet were externally rotated 10° using a plexiglass positioning frame. They also had a MRI exam (1T ONI OrthOne, GE Healthcare) which acquired axial and sagittal fat-suppressed proton density-weighted and coronal short-tau inversion recovery (STIR) sequences. The researchers assessed the coronal STIR sequence to mirror the PA x-ray images. The study participants then had a standing CT, using a modified commercial scanner (PedCAT, Curvebeam) that incorporated a custom radiolucent positioning system used to maintain foot external rotation and knee flexion angles similar to those used to acquire the radiographs. 360 images were acquired over a 360° projection angle. The time for the x-ray exam took approximately five to seven minutes to perform, and the standing CT exam was comparable at four minutes. Image interpretation took an average five minutes for each. Findings of all three exams – x-ray, standing CT, and MRI were compared. MR images identified 84 osteophytes and 10 subchondral cycsts, standing CT identified 80 and 12 respectively, and radiographs identified 50 and one respectively. The sensitivity (93%), accuracy (95%), and negative predictive value (93%) for detecting osteophytes was higher with STC imaging in comparison with fixed-flexed radiographs (60%, 79%, and 69% respectively. Standing CT outperformed both MRI and radiography with respect to showing medial meniscal extrusions, with six identified by standing CT, two by MRI and none by x-ray. The evidence suggests that standing CT may be an appropriate replacement for weight bearing knee radiographs. Standing CT provides improved visualization of knee osteoarthritic pathological features. They noted that standing imaging is essential to accurately view the joint space and bony changes can be assessed. They also noted that other potential advantages of standing CT are the ability to assess osteoarthritis progression precisely and the ability to reliably position the knee joint and measure the joint space width. They recommend that additional study is needed to assess the diagnostic performance of standing CT measures of joint space narrowing, progression of osteoarthritic features, and patellofemoral joint morphologic changes. Additionally, the custom radiolucent positioning system would need to be developed into a commercial, FDA-cleared product. Arun Singh, president and chief executive officer of Curvebeam, told Applied Radiology that the company is developing a third generation prototype of its foot and ankle scanner to include a knee-positioning feature with the plan to commercialize this. Singh said that Curvebeam expected the regulatory process to begin in 2016. Lawrence RC, Felson, DT, Helmick CG, et al. Estimates of the prevalence of arthritis and other rheumatic conditions in the United States. Part II. 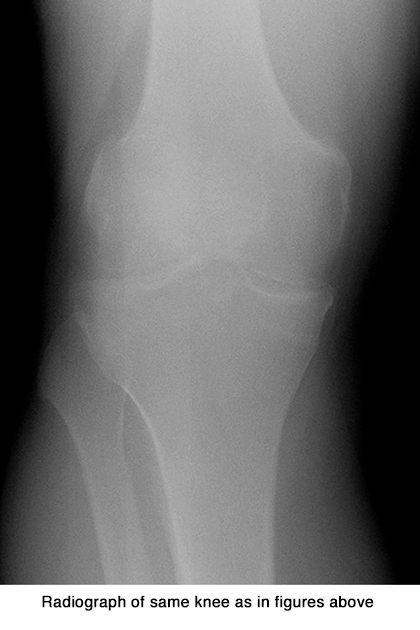 2008 Arthritis Rheum. ; 58: 26-35. Segal NA, Nevitt MC, Lynch JA, et al. Diagnostic performance of 3D standing CT imaging for detection of knee osteoarthritis features. 2015 Phy Sportsmed. ; 43(3): 213-220. Standing CT to diagnose knee osteoarthritis: Better performance than an x-ray, significantly less expensive than MRI. Appl Radiol.